The 2015 growing season is in full swing, and local agricultural producers are bringing a bounty of fresh vegetables, fruits and handmade crafts to a farmers market near you. Members of Northern Tier Buy Fresh Buy Local (NTBFBL) are anxious to get the word out about the many locations where their products are available, as well as direct marketing options. Endless Mountains Heritage Region (EMHR), which took NTBFBL under it’s stewardship in 2013, recently released the 2015 Local Food Guide representing more than 50 farmers, growers, restaurants, bakeries, maple and honey producers, and shops that sell home-grown products. A companion piece, the Pennsylvania Northern Tier Farmer’s Markets brochure provides the locations, hours of operation and other details about more than a dozen farmers markets in the six county area. Nicole Harris, Environmental Specialist at Mt. Pisgah State Park, agrees. The BFBL program became a logical extension of her work as an educator at the park a little more than a year ago, and she welcomed EMHR’s involvement in the program as a new avenue for promotion and partnerships. In Bradford County, there are farmers markets in Canton, Sayre, Rome and Wyalusing. In Sullivan County, farmers markets are operated in Dushore and Eagles Mere. In Susquehanna County, farmers markets can be found in Montrose and Hop Bottom. In Wyoming County, there is a farmers market in Eaton Township, across the river from Tunkhannock. 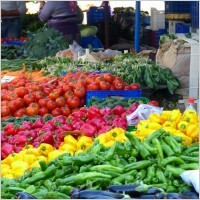 Most local markets are open just one or two days per week, and hours vary greatly. Interested readers are encouraged to pick up or download a copy of the Farmers Markets brochure at www.endlessmountainsheritage.org for specific details. Both the brochures and the Local Food Guide are available at many historical sites, museums and libraries in the Endless Mountains region; state parks and agency offices in Bradford, Potter, Sullivan,Susquehanna, Tioga and Wyoming counties and at most Chambers of Commerce in the area. A Taste of the Endless Mountains will return to the Troy Sale Barn on Saturday, October 17, running from 10 am to 2 pm. Harrison was overwhelmed last October by the vendor participation and number of patrons at the inaugural A Taste of the Endless Mountains. She saw the event as the perfect catalyst for introducing the public to sustainable agriculture, which starts with knowing and supporting local producers. Taking advantage of our access to quality local produce has long term cultural and economic benefits as well. The Local Food Guide and Farmers Markets brochures are also available at the Endless Mountains Visitors Center near Tunkhannock and the Endless Mountains Heritage Center in Towanda. Anybody who would like bulk copies for distribution may contact EMHR Director Annette Schultz at 570-265-1528.